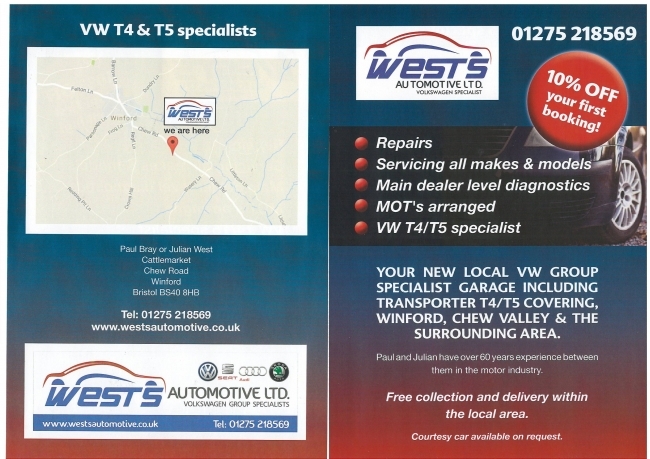 Contact Details for: Wests Automotive Ltd.
At Wests Automotive we take a pride in offering a personal and friendly one-to-one service to all our customers. We are therefore a member and are signed up to the Best Garage Guide's 'Good Service Charter'. We have many years of experience servicing, diagnosing and repairing motor vehicles. 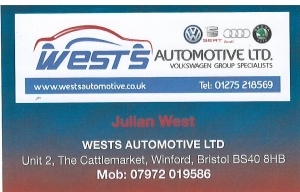 Wests Automotive Ltd is based in Winford, Somerset just south of Bristol, specialising in servicing and repairing Volkswagen (including VW Transporters), Audi, Skoda, Seat and other reputable makes of automobiles.